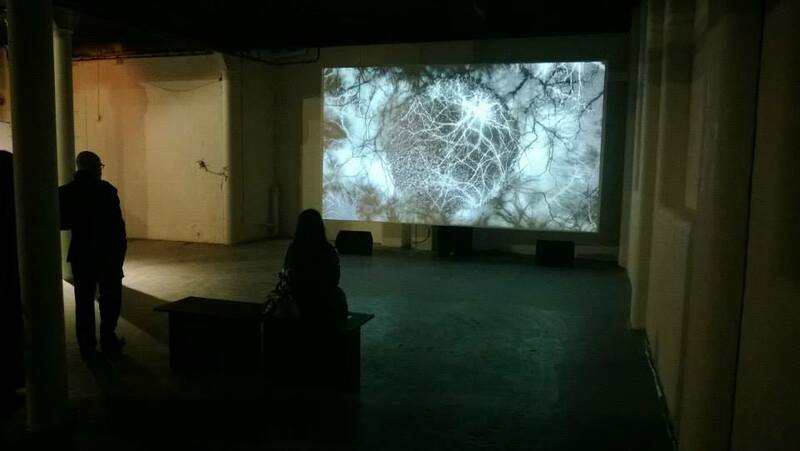 Curated by Rob Hilken the exhibition offers a chaste view on relationship of art and science. Five artists zoom on nature’s forces e.g. radiation, gravity, electricity, and magnetism, traditionally subjects of scientific investigation, appropriating them for sculpture, video and installation, as if mindful of Plato’s words ” things slip away and do not wait to be described”. (Timaeus, 495) In doing so, they manifestly challenge an older paradigm, formulated by C P Snow in 1959 Rede Lecture. In his view the two cultures, science and art could not find a common ground because of the mutual incomprehension, hostility and dislike between artists and scientists. It is not to dismiss Leonardo da Vinci’s (1452-1519) personal contribution to bridge over such a division in saying that C P Snow has still considerable following. Da Vinci worked during a period of European history when both science and art searched for new answers to questions raised already in the classical Greece and Rome. At that time Erasmus of Rotterdam(1466 – 1536) wrestled with the mysterious Dionysius the Areopagita, probably a Syrian thinker writing in 5th and 6th centuries, certainly before 532 AD. Although nothing much is certain about this Dionysius, he appears in the main gallery in Escorial Library near Madrid, on a fresco painted 1567 – 84. What makes this fresco significant is that it puts the 5th C thinker to observe an eclipse during the Crucifixion. Leaving aside the manipulation of the Easter dates for the liturgical purposes ( see http://www.rmg.co.uk and scroll to The Date of Easter) the Alexandrian version of the St Luke Gospel (23:44-45) places the event under the full moon in the mode of the chronicle’s report: it was about noon and darkness came over the whole land until three in the afternoon, for the sun stopped shining places the event under a full moon. The solar eclipse does not occur at full moons, only and new moons. The discrepancy between a belief and nature has not troubled those who suspended critical thought. Whereas Dionysius asks: What have you to say about the solar eclipse when the Saviour was put on the cross?….We saw the moon begin to hide the sun from the east…” addressing the question to Polycarp who lived more than three hundred years before him, in 69 – 155 AD. At the time of his writing there was no uniform method of determining the date of Easter.The strategy of writing an open letter under adopted name to a person who cannot receive it is a well known rhetorical device. Nevertheless, it illustrates the need for attentive observation. Erasmus of Rotterdam offers a three pathways to forge “the receptacle of becoming” (Plato, Timaeus, 51B): There are some people who live in a dream world, and there are some who face reality; and then there are those who turn one into the other.The exhibits bring forth all three. 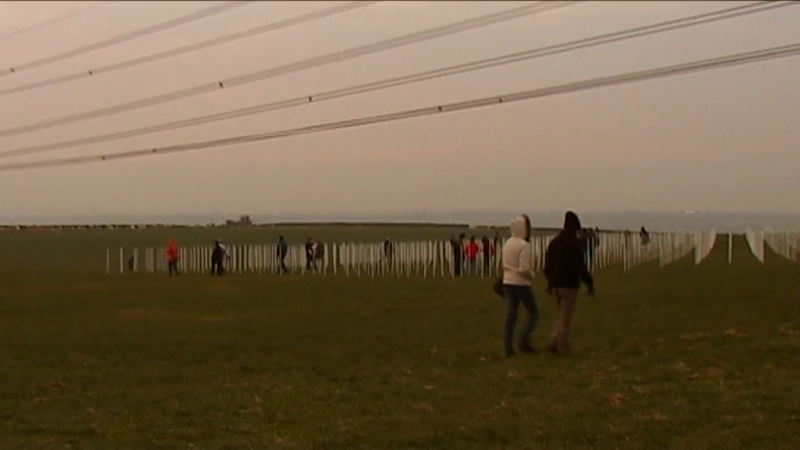 The Field by Richard Box is not the actual installation he made as an artist-in-residence at Bristol University. It is a later made video and c-print(both 2004). A document, an appropriation of an appropriation. A description of the original appears on the artist’s web site: A fluorescent tube glows when an electrical voltage is set up across it. The electric field set up inside the tube excites atoms of mercury gas, making them emit ultraviolet light. This invisible light strikes the phosphor coating on the glass tube, making it glow. 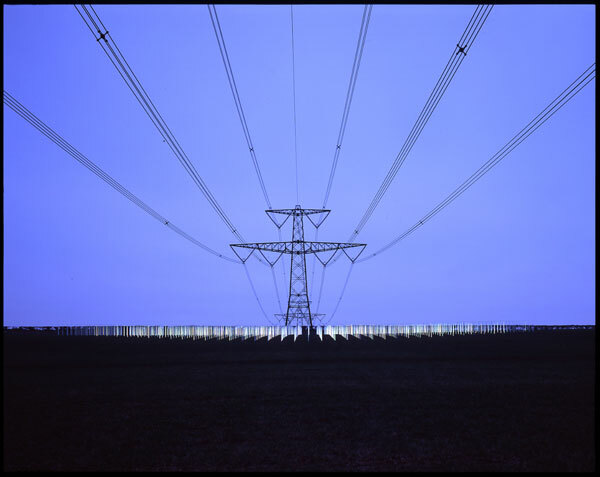 Because power lines are typically 400,000 volts, and Earth is at an electrical potential voltage of zero volts, pylons create electric fields between the cables they carry and the ground. Richard Box placed 1301 fluorescent tubes, collected from hospitals, over an area of 3 600 m squared under the high voltage wires“I was very impressed”, says Professor Henshaw, whose study of the health effects of close proximity to power lines is internationally recognised. 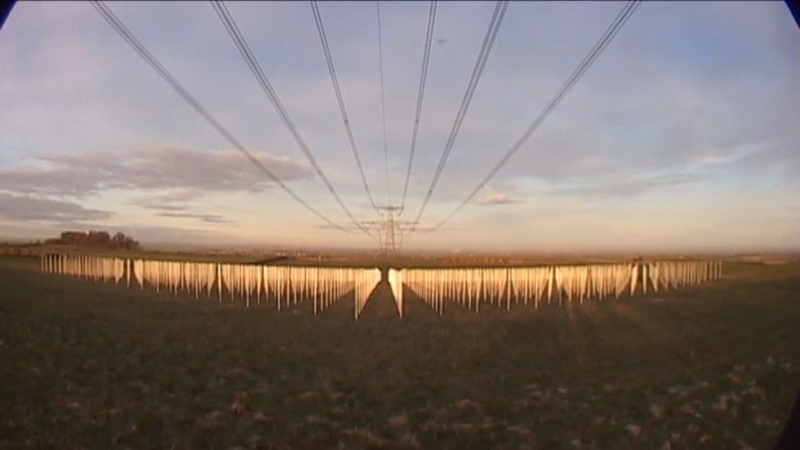 “It’s very creative and it illustrates graphically that power lines do indeed have these electrical fields around them. Even when the bulbs are on the way out, and start flashing or flickering in their sockets, they still light up under the power lines.” “It is very hard to explain to the public what these fields are- that’s the beauty of Richard’s work,” he said.” To have an artist make something about quite specific physics in an artistic way is inspiring to us.” (ibidem) Both the artist and the scientist share the delight of making the invisible visible. Recently, the death was announced of Walter de Maria (1935-2013) who, in 1977, made a Lightening Field in the Nevada Desert, New Mexico. It is still there. De Maria issued instruction that only six people at time may visit, and must stay overnight. For 2014 the reservation office states the visiting season starts on May 1st and ends in October, the cost of accommodation ranges from USD 100 – 250. Box’s Field is no more.Box placed his work near Bristol, near a major motorway, de Maria chose a remote desert in New Mexico. Box used found discarded objects, de Maria used 400 polished stainless steel poles, 20 feet 7and half in high, spaced 220 feet apart on the area of one mile from East to West and one kilometer from North to east. It was commissioned by the DIA Art Foundation which still manages the field and the visitors. 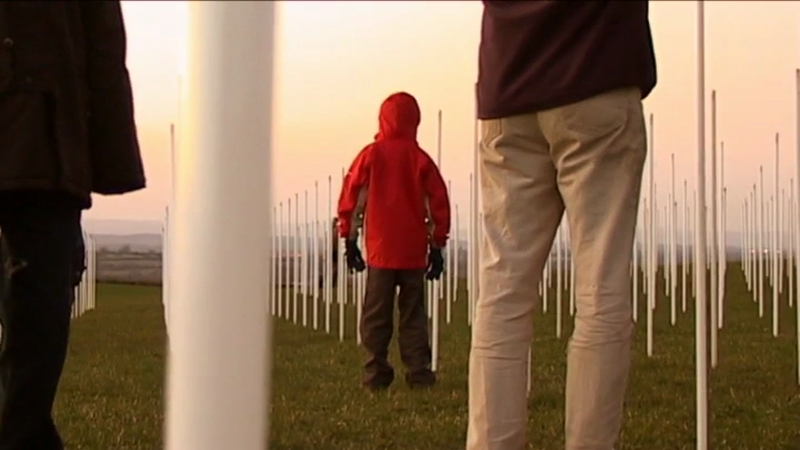 Box avoided both the Land Art exclusivity and high cost of production by using found tubes, and making his field freely accessible while it was in situ. 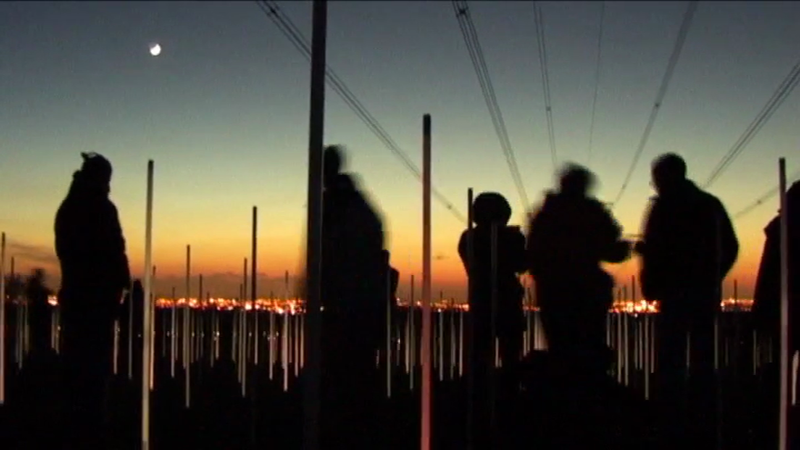 The video (2004, 8:59 minutes) ranges from description of the construction to the views of the whole at various times of the day. Post Warhol however, the multiples gained authority as originals. As if we were well schooled in the intricacies of approximation, and of staying critical of the lens based alchemy. 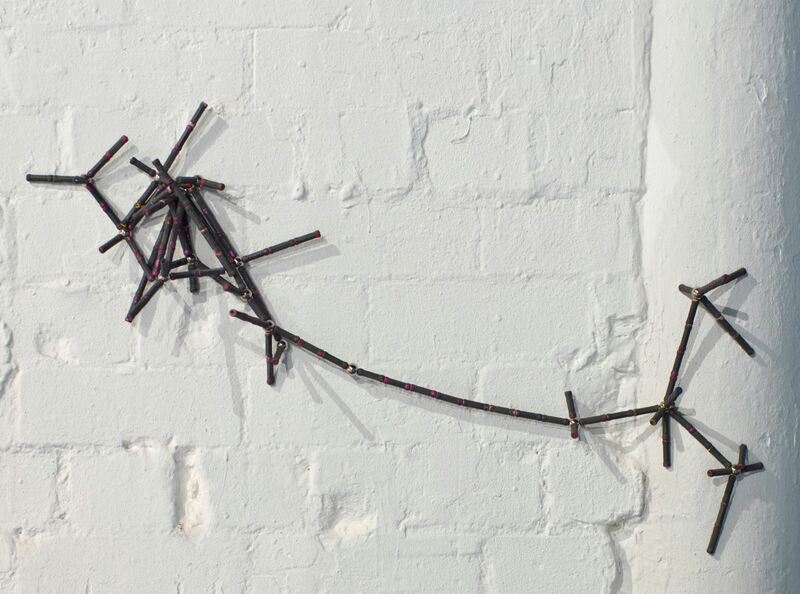 Adorably simple assembly of found timber lengths into a bundle of rays attached to a column and kept from tipping over by clumsy metal clips invites direct experience of the original. Mid- air the sculpture surges into a space like an end of the comet, reminiscent of the images of the almighty gods with hand full of light rays or arrows. in this view some barrels from the collapsed column are visible. Gravity and balance informed a somewhat granier, rustical addition of material elements on top of each other. Two free standing columns of oil drums sore up four metres as if in support of the gallery’s ceiling. 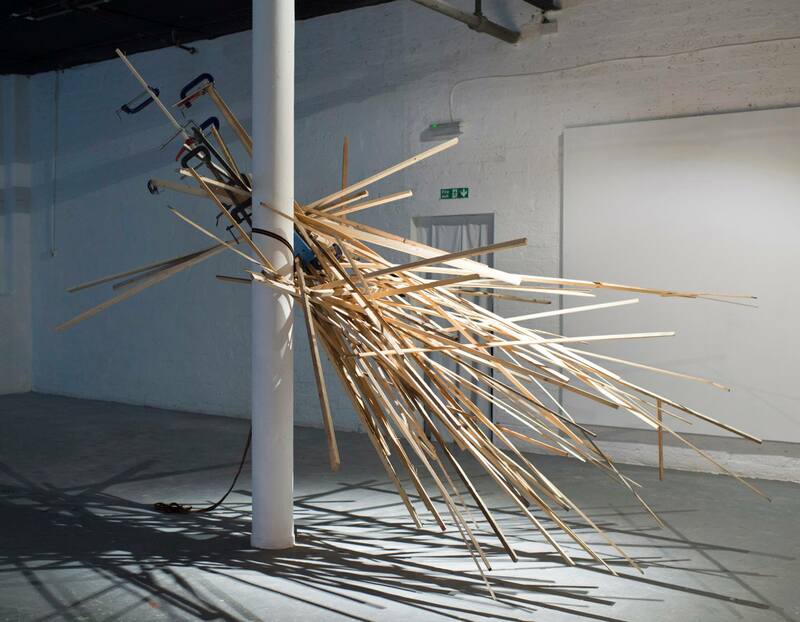 In Equipoise(2013) Pol Murphy wills the columns to collapse, one already did, to facilitate a construction to fail and allow a reconstruction. Even if it is not the eternal return, it brushes with Nietzsche’s idea of re-occurrence ( in Also Sprach Zarathustra) Are we willing to listen as much as an eagle and a serpent? In Energie(2007) Thorsten Fleisch moved into animation of still records with a commitment of the serial researcher. He built a device that makes high voltage discharge into the air and exposed to it sheets of photographic paper. Having assembled a number of images, he then looped and edited the set to animate them into a film. A seriously labourious process, it is reminiscent of all early scientific experiments. In this case – the solution was art film made by electricity. The doubt about our sensitivities and abilities to be attentive to detail, leads often to laborious explanatory utterances. Gracefully avoided and replaced by the visual, the exhibition offers two modes, one with the image animated and sound added (Thorsten Fleisch) the other with the image forged in real time in front of our eyes in an installation with the sound integrally produced by it and manipulated by the artist. 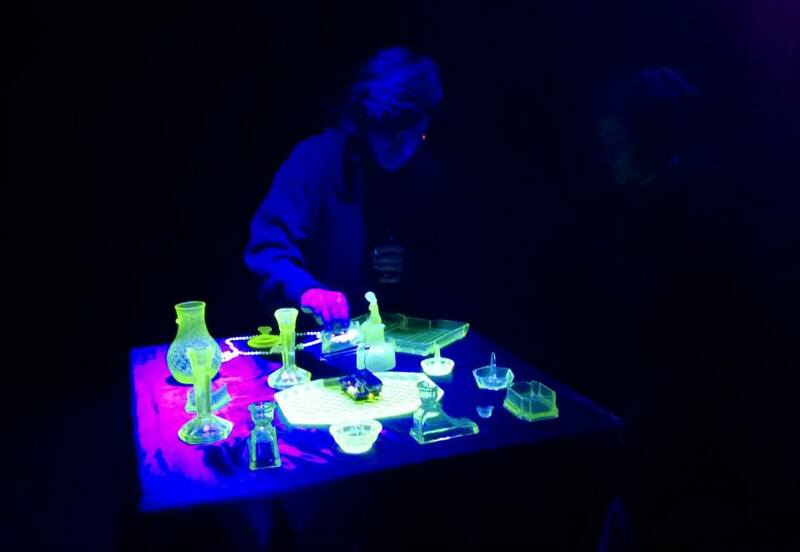 For Stochastic process 92(2013) Christian Cherene used a dark room for installing green glass and Geiger counter on a table top, to make radioactivity visible as green glass, and audible as the ticking of the Geiger. Its didactic appearance was resolutely displaced by the sublime beauty of the green objects silently threatening and being threatened by the sound A theatrical accent of the display evoked both alchemy and jewellery – as well as scientific experiments conducted in the darkness ( see Christian Cherene, Stochastic Process 92, on http://www.youtube.com). The sound slightly compromises its pristine adult character by a shift to the youth culture (to the extent to which, in a given culture, the audible material can be age related). “…the more it climbs, the more language falters, and when it has passed up and beyond ascent, it will turn silent completely, since it will finally be at once with who is indescribable.” So writes Dionysius in his Mystical Theology (1033). Just by changing one word, replacing who with what, the sentence becomes not the praise of the folly but a praise of observation as tacit visual force. In these artworks the material elements are not in some sacramental action as observable for ex in Baroque art. The nature’s forces are a source of awe, and an offshoot of knowledge and surprise, and intoxication with both. No wonder that another concept from Dionysius appears as a closure on offer: god sleeps and gets drunk, he proposed – the drunkenness is the state in which all become who is their cause. 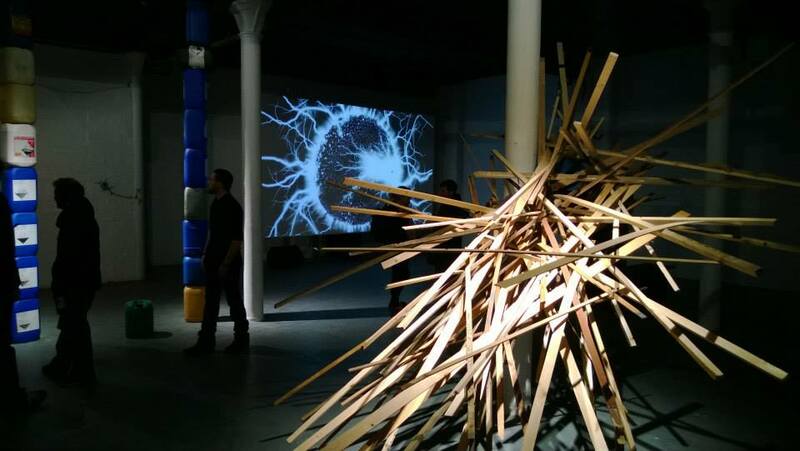 This exhibition is drunk on science and beauty and becomes a visual feast (= the increased activity of the left dorsolateral prefrontal cortex), visual force. Transformatory, reserved, observing, playful, intellectual and aesthetic experience. 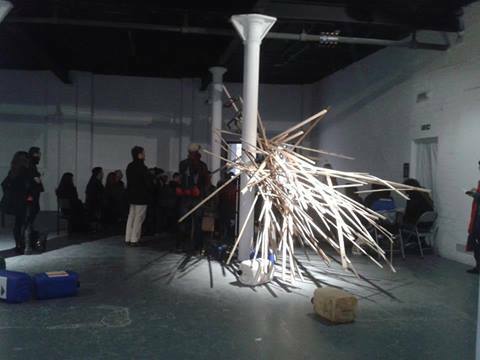 This entry was posted in essay, review and tagged Aisling O'Beirn, art., balance, C P Snow, Catalyst Arts Belfast, Christian Cherene, electricity, Erasmus of Rotterdam, gravity, Italo Calvino, magnetism, pol Murphy, Pseudo-Dionysius, radioactivity, Richard Box, science, Thorsten Fleisch, Timaeus. Bookmark the permalink. I have just today received Jordan’s photos. Here’s a couple that show all the works well. I hope it’s not too late to add them if you want to. I hadn’t actually read the article when I emailed you those. I see you managed to source photos that illustrated your thoughts well. Many thanks for your time and thoughts :) I experienced two Walter de Maria works this year, having never seen any before – Earth Room and the Broken Kilometer, both in New York and felt the extraordinary power of both.